Made by the Peterson Co, located in Ohio. Circa 1960. 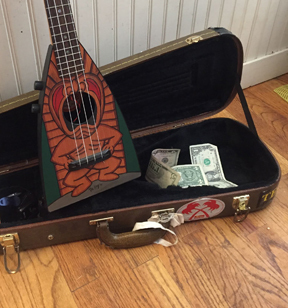 These Peterson built instruments are very much like Swaggerty's "Kooky Uke" line. These (the Peterson instruments) included the Polk-A-Lay-Lee and the Wander-le-le. The Polk-A-Lay-Lee was reportedly built as part of a failed advertising scheme for Polk brothers. Polk Bros. was the dominating electronics/appliance retailer in the Chicago market from about 1935 through the 1980s. However, the box and accompanying booklet make no mention of the Polk Brothers store. The box does however state that they are "Hand Made of Solid wood" but on all the Polk-A-Lay-Lee's I have seen it is fairly obvious that at least the top and back are plywood. The Polk-A-Lay-Lee was offered in brown, natural, red, or black.